Stephanie at Loft Creations has been creating again! 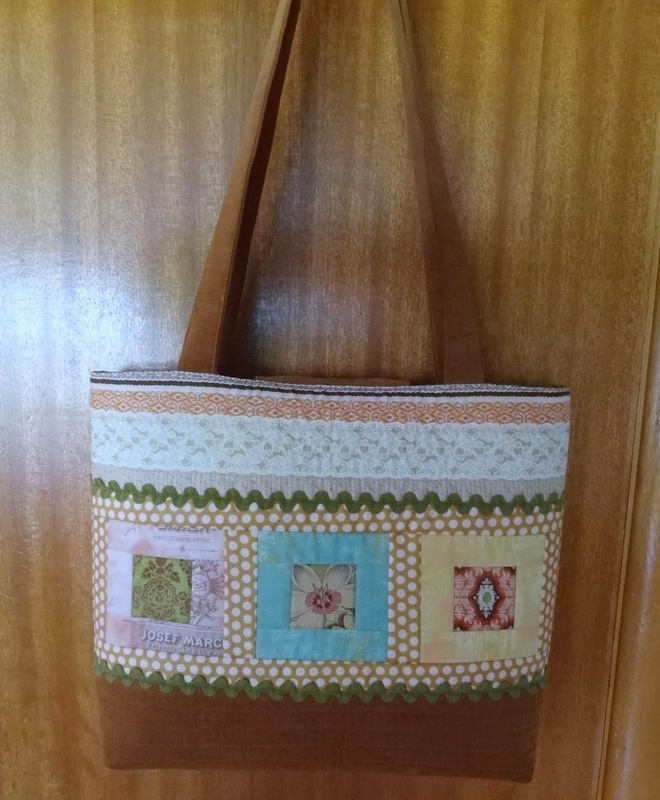 I recently had the opportunity to test her new pattern "Prairie Tote". The pattern is available as a PDF download and also kitted from Connecting Threads HERE. this book, one of my favorites, by Isabella Bird. I thought the fabric line was reminiscent of something you might see out on the prairie during Isabella's time. This is a great read! 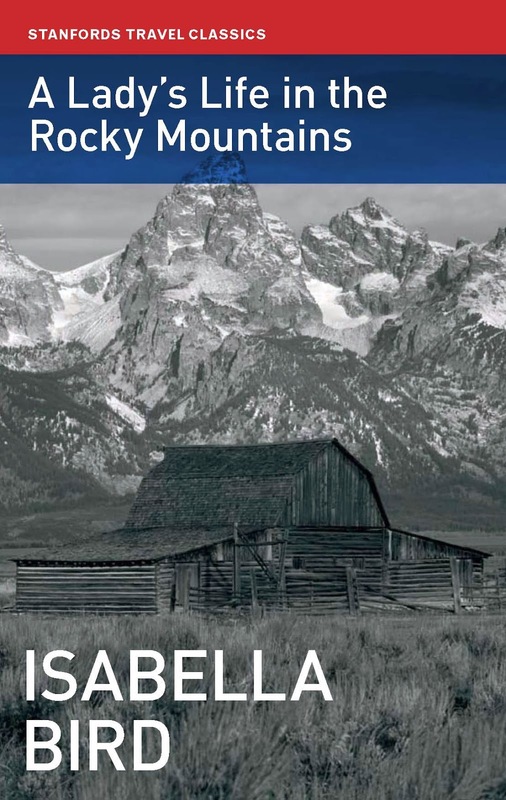 It's a journal of her 6 month journey, alone and on horseback, mostly during winter through the Rocky Mountains in 1873. A journey like this was unheard of for that time, let alone, a woman! I can just imagine Isabella sitting at the train station with her small trunk waiting to head West across the prairie for her adventure! I bet she didn't use anything from her trunk! She could have carried a similar bag on her person for any "necessities" she might need for the long train ride west, and perhaps it even survived her 6 month journey through the high wilderness if for nothing else but to transport her precious journal back home. I used 21 wale corduroy for the base of the bag and the handles. I just love working with it! It gives a little extra stability to the bag and feels so luscious! Oh, and not to forget, Stephanie's new book, Uncommonly Corduroy, comes out next month and has all kinds of projects, including quilts using corduroy! I wonder what Isabella would have thought of cell phones had she lived to our electronic age! 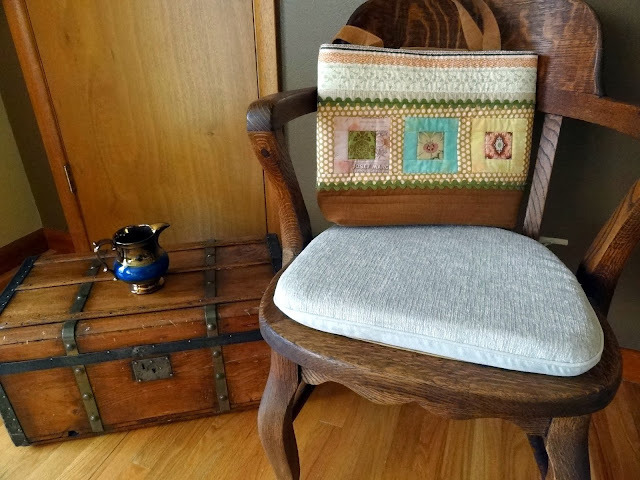 Do hop on over to Stephanie's blog and see her creation. Don't forget, you can buy it kitted or the PDF download only at Connecting Threads! 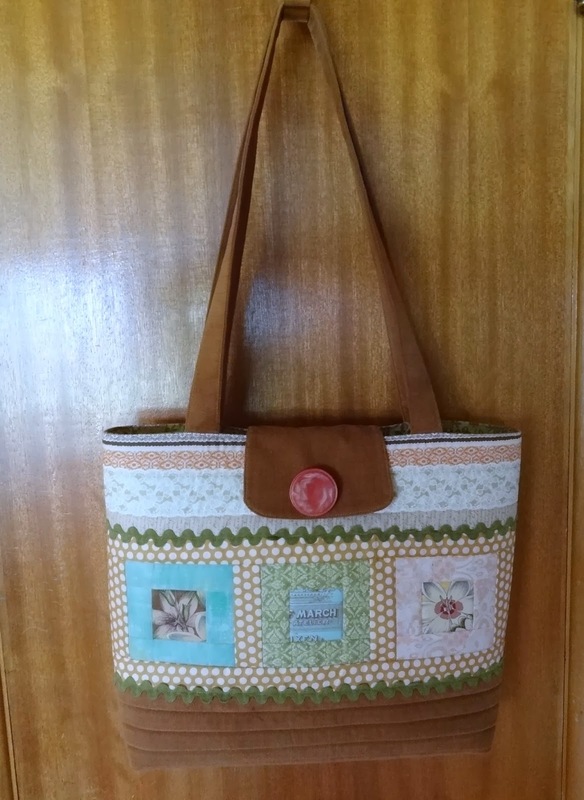 I love Stephanie's new bag pattern and your version of it is gorgeous. Love the photo styling too. The book looks very interesting - must check that out on Amazon. What a wonderful post! I love your photos, bag, props and story reference. You are great at keeping Supreme Secrets! It turned out beautifully and your photos of it are stunning. The bag looks very nice, but I'm most excited by your praise of the book!! Another one to add to my reading list! Thanks for the heads up. What a lovely bag & I love how you took the pictures . I really enjoyed your post ! Beautiful photos! At first I thought the brown bottom and straps were made from a leather. Nice and "old timey" looking! Another great finish by you! Love the bag and the book sounds like an interesting read! Very nice :-) I like the fabric you choose and the reasons behind it. I've used that fabric for a quilt that I need to finish! 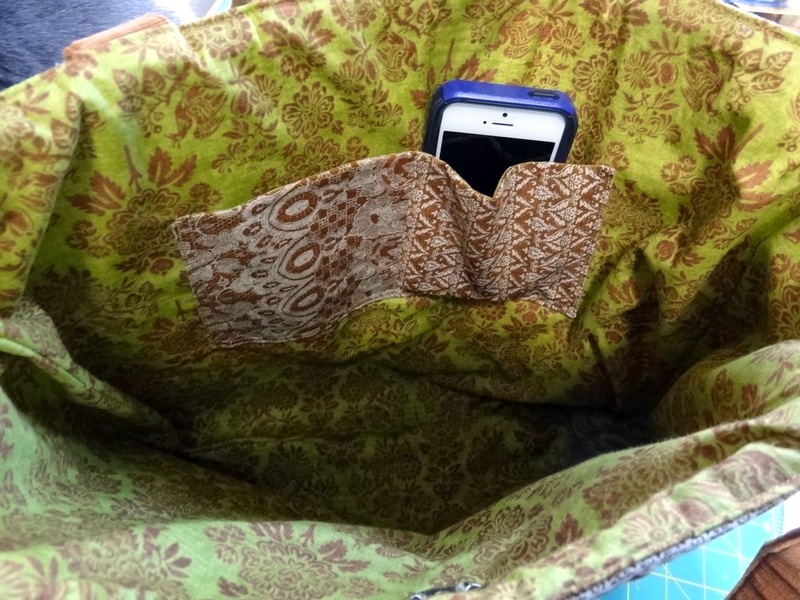 Wow, adorable purse and I think I'll see if I can download the book you mentioned on my Kindle - sounds fascinating. I love the idea of corduroy in a quilt, esp for guys quilts. Can't wait to see her new book!! Hugs and Happy New Year. Great bag and love how you made yours. The corduroy is a great touch! I really love your version of Stephanie's tote. You two make a great team! You made me imagine her ride and her version of the bag, thanks for a lovely story. The bag looks great, just like your photos. Thanks for the heads up on the book. 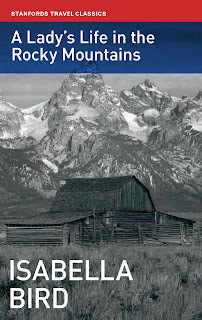 Since I live in Colorado, I'll for sure read it. very pretty! The corduroy almost looks like leather. Lovely bag. Found a copy of the book army public library. I'm guessing my recent travels through the Rocky Mountains was a little easier. What a beautiful place. Just love iPad auto correct! No army. At my local public library. Found other books from this author to check out. Thanks for recommending the book. 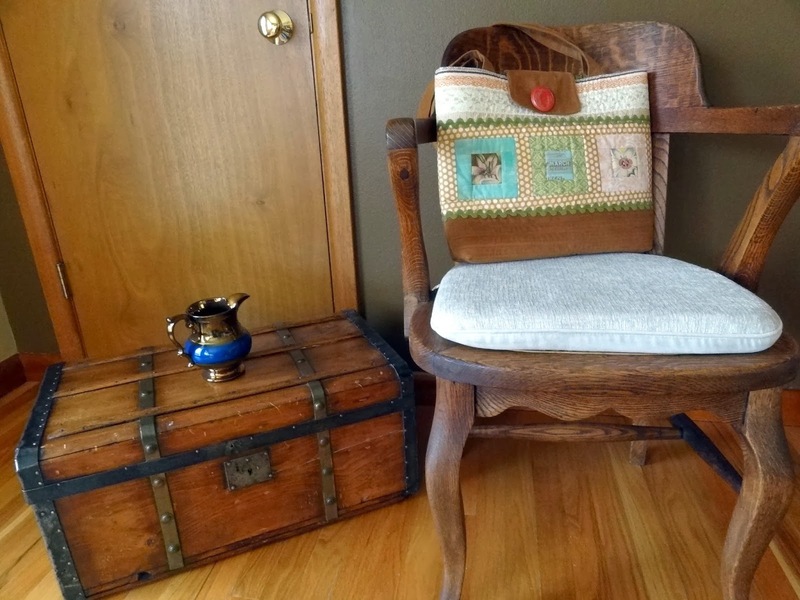 Great story to go with a gorgeous bag! The blooms and the grassy green is making me crave for a little bit of spring! Hope you are staying warm and the weather isn't too bad. Calendar BOM is a Flimsy!